Wide range of usage: the mounting foam tape roll fits for many occasions, such as car signs, nameplates, signs, doors and windows decoration, scrapbooking, cards making, etc. Double sided sponge tape: the sponge tape is sticky in double sides, easy to stick and tear, stickiness can be maintained for a long time, can help for heat resistance and shock absorbing. Sponge tape material: the mounting tape is made of PE foam, have strong adhesion, good retention, anti-ultraviolet, temperature, water, solvent, flame and rub resistant. Strong Adhesion! Natural thick rubber adhesive bonds to most rough and smooth surfaces for a tight seal, yet moisture-resistant, enhances high durability. Features: Color:black Length: 10 M / 32.8' Width: 40mm /1.57'' Thickness: 1 mm/ 0.04 inch. 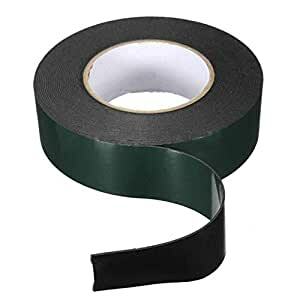 Material:PE Foam Type:Double-sided Foam Tape Designed for the attachment of a wide variety of automotive exterior and interior trim including body side moldings, claddings, rock panel trim, wheel flares, bumper trim and most other automotive trim. Strong adhesion to automotive substrates. Weather and car wash resistant. Confortable. Can be used on textured surfaces, such as painted cement or brick. High-strength core maintains a thin, consistent bond line. Easy liner release. Perfect to use on LED strip mounting at indoor or outdoor (included bathroom). Package Included: 1 x Tape Feedback: We greatly appreciate your Positive feedback. Please do not leave negative feedback or submit A-Z Claim without any contact. If you haven't received item in time, please contact us and we will solve it for you.